Have You Ever Eaten at a Woolworth’s Lunch Counter? The Best Food In the World! 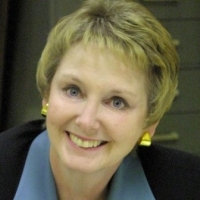 My mother, Creola Kincaid Lewis, worked in the Fish, Pet and Plants department of the Woolworth store in Arkansas City, Kansas, in the 1950s and 1960s. Every dime she made went to support our family, so eating at the lunch counter was a rare treat. But, sometimes my brother and I were given that treat! When we did, my favorite thing was a Grilled Cheese Sandwich and a Vanilla Malt or a Deluxe Baked Ham Sandwich and a Strawberry Malt. I once asked my mother, “Don’t you think this is the best food in the world?” I doubt that she did, especially since she was a tremendously good cook. However, I know she liked eating at the lunch counter as much as I did, because we planned those special lunches as if they were big events. Not long ago a seller on e-bay, scram85, offered a 1964 menu and used the photos shown here. 1964! I would have held a menu just like it, as a teenager. I wanted it very much and bid it up to $205 before I dropped out. It sold for a little over that. I was probably lucky someone else was more impulsive than me. However, I may always regret not going just a few dollars more in an effort to buy it. Nowadays I eat at restaurants more than I want to, although none of them have counter service. If they did, I probably would rather sit at a table and I would probably think the food was edible but not wonderful. Nevertheless, I wish I could ask Ms. Lucille, who managed the lunch counter at Woolworth’s, to fix me a sandwich and a malt. And, I wish Mom and I could sit together at the counter and enjoy it. Have you ever eaten at at Woolworth’s lunch counter? First comment! I called my Mom and she said she hadn’t ever been in a Woolworth’s store, just Kresge, but her Great-Aunt worked in the Sewing Department of a Woolworth’s store in Colorado Springs, in the 1960’s and 1970’s, up until it closed. She’s going to call her and ask if she ate at the lunch counter! Fun menu and it all looks yummy! D.
I used to have a Coke and fries almost every day after school at the Woolworth’s store in Ark City. I remember your mother and Billy Stocking, who sold records and would play 45’s for us when we requested it. The menu really brought back memories! J.F. I was going to say that you’re showing your age, but then I remembered that I used eat at the Woolworth’s counter in Cheyenne in the 1950’s. That was the best store in town, for a kid. My mom would drop us off on Saturday while she got her hair done and we would roam all over the store. When I saved up enough money I would buy a plywood airplane. Good to see you writing some more! 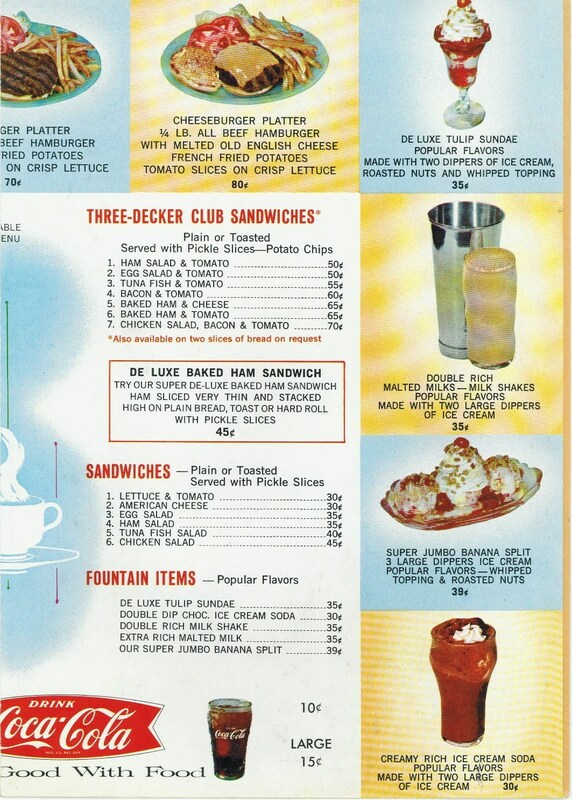 I loved looking at this menu. A Tulip Sundae was my favorite thing, in Seattle. I think it was named that because of the glass it was in, but as a child I thought it was supposed to look like a tulip, only I had never seen a tulip that looked like that! I’m sure I’m not the only one who wishes we still had a Woolworth’s store and its lunch counter. I never had the pleasure of eating at a Woolworth’s lunch counter or being in a Woolworth’s store, here in the U.S., but there are still some in Australia and I think in the UK. My wife and I went into one about ten years ago. I liked the Grilled Cheese sandwiches. They had better French Fries than McDonald’s. I ate at Woolworth’s in Columbus, OH in the early 1970s, then they closed in the late 1970s. The store they used to be in has never been successful for anything else. Thanks for your church security seminar last month. It was eye opening, for sure, but I thought the day was great and the time seemed to fly by. D.H.
My grandmother used to take us to the Woolworth’s counter in Denver. It was a very rare treat and they took it out when I was still pretty young. I don’t remember how the food was but I do remember what a special outing it was to go with my grandmother on the bus, get to put the bus token in the collector, and sit with Grandma at a grownup counter! 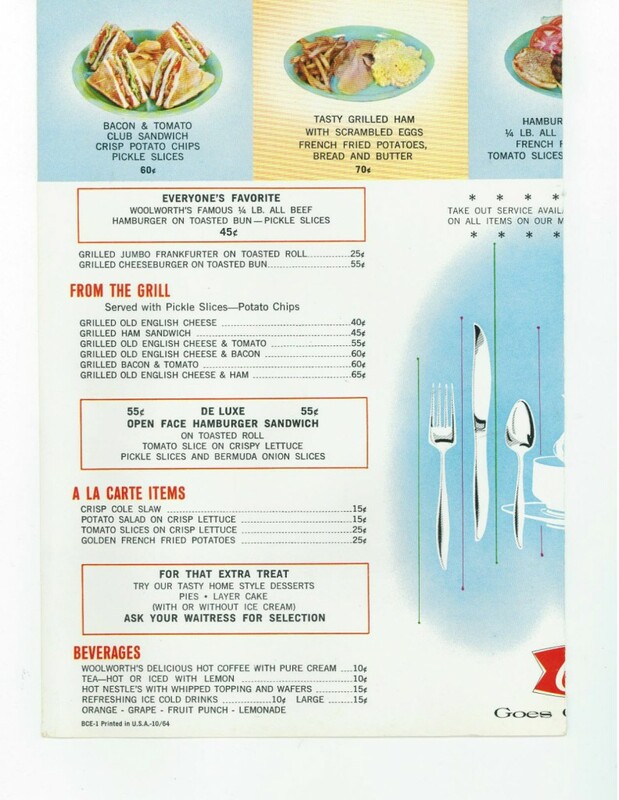 I just saw your posting while googling Woolworth’s old menus and I just want to say thank you for posting not only this old 1964 menu, but also your comments about the times, and how blacks were not allowed to eat with us. One of my favorite events occurred in 1963 or 64 when my very best High School friend, Marylou, and myself had saved up our money to take a day trip downtown (Sacramento CA) to have lunch and see the movie “Cleopatra”, with Elizabeth Taylor. We ate at the lunch counter across the street from the theater, and it was Woolworth’s. We had taken the bus, too. .......the moment one definitely commits oneself, then Providence moves too.